For anybody wondering whether the Green Party could work with New Zealand First, rest easy. The answer is yes. And what’s more, they’ll even throw in a Chart-Reading 101 session for free. In a sign of future Cabinet collegiality, the Greens’ Julie-Anne Genter leapt to Winston Peters' aid during the Parliamentary Finance and Expenditure Committee’s grilling of Reserve Bank Governor Graeme Wheeler, Deputy Governor Grant Spencer and Assistant Governor John McDermott on Thursday. “Look at that chart, and try to explain to me what on earth that chart means,” Peters had demanded regarding figure 5.3 in the Reserve Bank’s May Monetary Policy Statement. The chart – pictured below (or on page 29 of the MPS) – indicates working age population net immigration is forecast by the Bank to grow every quarter over the next three years, although at a steadily declining rate over that period. And perhaps that downward trend was what had confuddled Peters. “It’s still positive – net migration’s still positive,” Genter helpfully pointed out to the New Zealand First leader and potential future front-bench colleague, who was sitting beside her. “Yeah, it’s declining but it’s still positive.” Another kind, helpful reply from the Green. It might be of interest to Andrew Little that Reserve Bank Assistant Governor John McDermott stepped into the firing line. “I will answer.” The ever-eager RBNZ Head of Economics offered up his own chart interpretation services. “The graph is showing that there will still be a net increase in immigration over the next three years. But it will be at a lesser rate than currently. That’s what the graph says, and hopefully it says the same thing as the words,” he said. “That’s quarterly,” Deputy Governor Grant Spencer added for Peters’ benefit. “Perhaps if I could help.” Graeme Wheeler, the Reserve Bank’s chief chart interpreter, chipped in. “If you take the net immigration at working age population since the beginning of 2012, if you added up the area underneath that to the vertical line, that would come to about 204,000 people – so it’s about 6% of the labour force. “Then take the area underneath the other line, passed the perpendicular, that’s about roughly 130,000 extra people. So, it’s extra – the quarterly rate of increase is slowing, but total migration is still expanding,” the Governor said. Peters was no doubt touched by the collegiality and desire by everyone to lend a helping hand. Perhaps the Reserve Bank should have presented options for their immigration forecasts based on who might win the election, he indicated. Had this been Parliament’s Question Time, asking a Minister to reveal what they knew that others didn’t would have opened up a realm of potential answers. 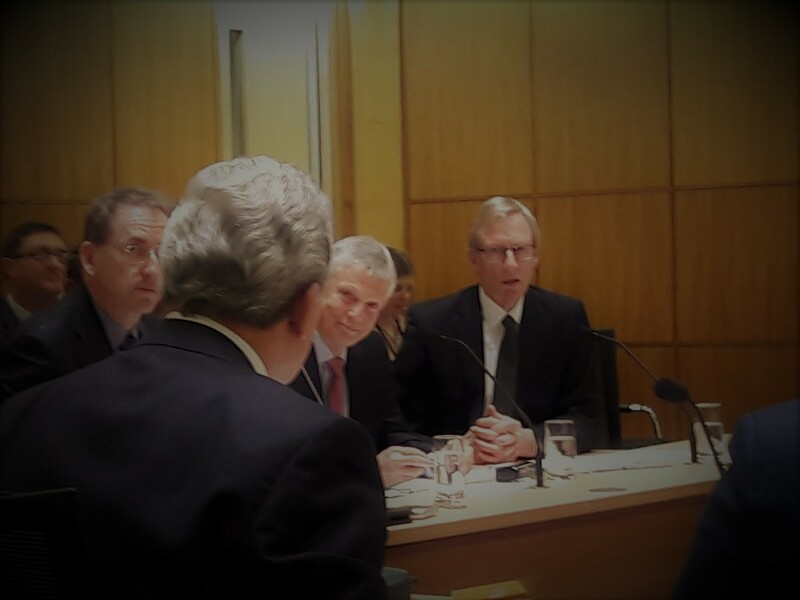 But RBNZ official McDermott kept to the script. “We have been making these forecasts because it’s necessary to do so. We also have been quite open that this is a very difficult measure to actually forecast,” he said. As in February, the discussion drifted to how the migration composition was key, rather than the chart itself - more single 20-year-olds now who were joining the workforce versus returning families after 9/11. Those families had spent cash, inflation rose and the Reserve Bank had to raise interest rates. This time around, migrants aren’t spending as much and are suppressing wage pressures. And so ended the lesson, with everyone a little wiser and the beginnings of a blueprint for how those potentially around Andrew Little’s Cabinet table will go that extra distance to lend one another a helping hand. This is going to sound absurd , but who cares whether Winston could read or not , he may be our next PM . A cobbled together coalition of Greenlabourmaorifirst would not never be able to agree on who will be PM and Winston may not just be kingmaker , he could be King by simply insisting he be appointed PM . Winston will demand to be PM, for 2 years. Bill or Andrew will get the sack, giving the new Nat or Lab leader time to 'grow'. In year 3 Wsnton steps down having had his fun. The new lab or nat leader stepping up in year 3 ready for election time. Would Nat of Lab turn down that deal? So we have the Sir Humphries all in a room with Winston and the other lovelies unintelligibly discussing border flow charts . And none of them even know they are ignoring the big question which is what is our desired total population. Immigration are still processing applications prior to the late 2016 immigration settings tweak. Maybe they have an idea of the amount of applications likely to be accepted once the backlog is worked through. You are mis-reading that chart. The actual data is from Stats NZ, It is the RBNZ who supplied the forecast. Peters is like Trump, he doesn't need to read all these stuff to understand issues, form opinions, etc. He goes with gut instinct and his own reading of the people and the present mood and he is usually astute and bang on. Don't expect him to be a regular politician. He is a maverick and they operate by different rules, and usually win. Is this satire? I'm honestly not sure any more. Peters is no fool and would have fully understood the chart. His spluttering was because it removes one of his key election planks - burgeoning immigration. Expect to see more of this chart from English and co over coming months. The suggestion that this RB prediction is contrived at the behest of Government, is absurd. Wheeler would be very aware he'll need to defend his conclusions on immigration trends against fierce interrogation from pollies, media and analysts. My question is does it include students completing studies, getting a job and applying for permanent residence.? It's the whisky levels falling, causing disequilibrium. Which lets the incoherent blather out. "Look at that chart, and try to explain to me what on earth that chart means" : he had no idea but had an instinctive fear that immigration might not be the election platform he could still stand on, and wanted to discredit the creators of the graph; a primal Trumpesque (or Muldoonist)urge. I think the answer is Winston's problem, Immigrants are only 6 % of the workforce. They are not the cause of all the problems he wants them to be. Hence , he cannot "understand" the figures. Don't let this chart mislead you. This represents all those migrants who come directly to join our workforce on some sort of work or residence visa approved overseas. This does not, however, include those tens of thousands who previously entered our country as students and have then gone on to gain work visas or residence permits. I expect such misleading facts from the National party but not from RBNZ. 6% of the labour force since 2012, it will be higher now. That is still a significant proportion, enough at the margins to keep wage growth down. It does seem to me somewhat surreal that there are conversations like these among politicians and leaders of our public institutions when we have not yet had the national conversation about what size our population should grow to. Should we have that conversation? What do other commentators think? That chart looks a bit political doesn't it. That forward projection is a reflection of what the current government thinks New Zealanders would like to happen, but not what the current government wants to happen, or what will happen if the current government is re-elected. However, if Labour/Green come to power then that chart will likely become reality. I'm not surprised Peters called called the RBNZ out on it. Perhaps this graph may show another side of the story.. I accessed Net Migration of non-NZ citizens from Stats NZ Infoshare as part of my Year 13 Statistics Internal on Time Series. I opted for this data due to the impact net migration of non-NZ citizens may have on their job opportunities and prospects of owning their own home. I also encouraged debate around political views on migration - sadly most of them were clueless though at 17/18 I was probably more interested in other things than listening to politicians bleat on.. still some began asking questions.. The data is as recent at Mar 2017. Excuse my instructions on page 1 but the graph on page 2 paints an interesting picture for the next two years. The liink for the document including the chart and some discussion implied that student numbers were not considered. Key word search gave a better definition and it seemed to be just one of our many paths of immigration.